“Three Identical Strangers” is my favorite documentary of 2018, so I’ve added it to my Movies You Might Not Know list. It’s the story of triplets born in New York in 1961 who were separated when they were six months old and adopted by a blue collar family, a middle class family, and a well-to-do family — none of whom knew that the boys came from an identical set of three. The guys didn’t find out until they were 19, when one of them went off to college and was greeted by all these people he had never met who acted as if they knew him. That’s because one of his brothers had been at that same school. When the two boys eventually met, they were surprised, but that turned to shock when they discovered the third. That’s a hell of an intriguing plot, but documentarian Tim Wardle goes beyond that part of the story to delve into the mystery of how the whole thing began. By the end, he’s talked to the brothers, their wives, their parents, and a variety of other people who crossed their paths. In doing so, he takes the viewer through a roller coaster of emotions that I don’t want to spoil, so I won’t tell you any more, other than to say you’ve got to see this story. Even then, you’ll have lots of questions the subjects themselves can’t answer. The movie is based, in large part, on the work of investigative reporter Lawrence Wright, who wrote about the triplets in a 1995 New Yorker piece. He appears in the documentary to add to the narrative — and to go along on Wardle’s search for more answers. It took Wardle four years to convince the brothers to take part in the movie and let him tell their story. They had been very open about their lives in a massive media crush soon after they’d met at 19, but over the ensuing decades, as their lives changed, they became more wary of the press and the untold secrets behind their story. 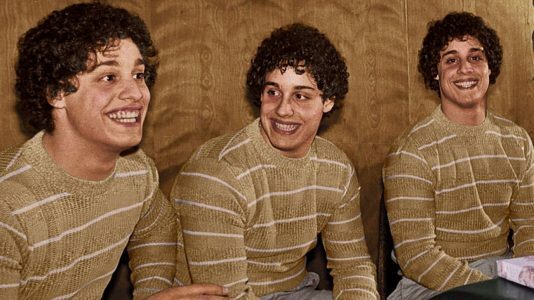 “Three Identical Strangers” is going to play on CNN in early 2019, so it probably won’t be on Netflix or Amazon Prime until then — but you can see it now on DVD, as I did. If it sounds like something you’re interested in, do yourself a favor and don’t watch the trailer or read any other reviews, because they’ll give away too much of this amazing story that you’ll want to see unravel with your own eyes.